What about Valentine's, and the Quintessence building? The Park South redevelopment plan announced by Albany Med Tuesday covers the block of New Scotland Ave that includes the music club Valentine's and the former Quintessence diner building. A lot of people have had a lot of good times at those spots. That block is set to be completely cleared for new construction. So, what happens to both those places now? The website for Valentine's includes the tagline: "We're all about the urban renewal." 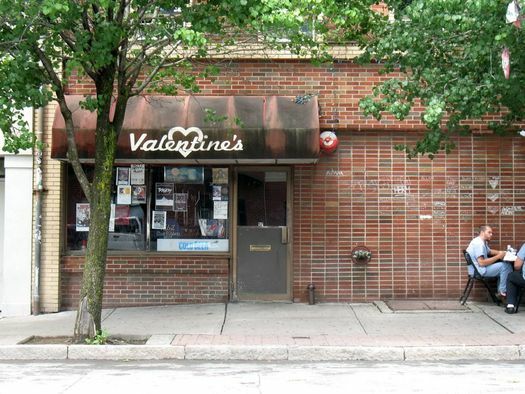 And ever since redevelopment was first proposed for Park South -- dating back at least 7 years -- there have been rumors that Valentine's spot was in jeopardy. But every time word circulated that the end was near... nothing. But now it's here. We emailed with Valentine's owner Howard Glassman Tuesday after the redevelopment announcement. He said he's been asking for info about when he'll have to be out of the leased building, but has yet to hear. He said he'll have a better sense of where the club's headed after he gets word. He was hoping that, like residents of the nearby apartments slated for demolition, Valentine's would have until the end of 2013. As Glassman joked via email: "You just don't throw a funeral party together in a few days. Or maybe you do." 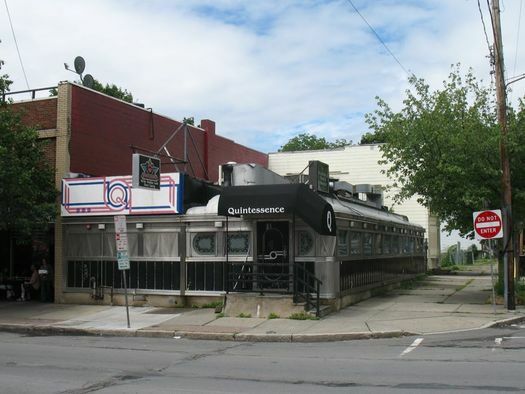 The Fodero diner building that housed the restaurant Quintessence -- twice -- has been in Albany since the 1930s (or 40s), after it was shipped up from New Jersey. 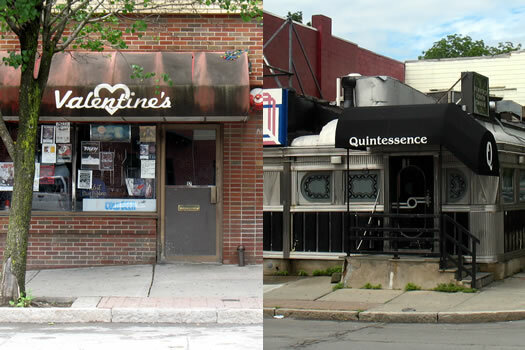 The owners of the revived Quintessence sold to Albany Med last fall. On Tuesday, Albany Med CEO James Barba said the building is not part of the redevelopment plan. Said Barba in response to a reporter's question about the "iconic" diner building: "It's iconic to some..." pausing as the audience began to laugh "... and not to others." He didn't count himself among the iconic crowd. But: "If anyone would like it, free of charge, and is willing to move it, we would be happy to give it away." He said he was serious. So if you've ever wanted a diner, here's your chance. Albany Med says serious inquiries can be sent to albanymedcommunications@mail.amc.edu. I have to be truthful. As someone who has lived in this area, to me it's a diner. It's been a good restaurant, but it looks like a diner and it feels like a diner. Reporter: So what's going to happen? Well, it is not a part of this plan. However, if anyone would like it (laughter) -- I'm not being silly -- If anyone would like it, free of charge, and is willing to move it, we would be happy to give it away. So, I'm respectful of the people who do believe there's an iconic nature to that structure. But we don't have a plan for it in this set of plans. Since neither building is handicapped accessible, I'm really hoping that these places will return in venues that are accessible - especially Valentine's since there are many shows I'd have gone to - if the shows weren't up a flight of stairs. I'm certain that when Mr. Barba thinks of diners the words "Greasy Spoon" are foremost. Albany Med, like most hospitals, doesn't give a dam about history. Show me a hospital in a historic building and I'll show you a closed hospital. "Said Barba in response to a reporter's question about the "iconic" diner building: "It's iconic to some..." pausing as the audience began to laugh "... and not to others." He didn't count himself among the iconic crowd." In related news, Albany Med CEO James Barba is an a**hole. It's not like they can't relocate. There's plenty of similar holes for Valentineâ€™s to fill on Central Ave, by Waterworks, ROCKS or Fuzebox. @Jeremy, Lucy: In fairness to Barba his comment was more about expressing his own viewpoint about the building than a statement about its inherent value. I went back and transcribed the full section from my recording and updated the post so you can read the whole section in context. In the moment it came off more as a people-have-different-opinions-it's-just-not-for-me kind of statement. It's too bad they couldn't focus their energies on the Lombardo's property instead of taking out a perfectly functional block of buildings (maybe excepting the diner). And this plan's blank slate approach to two whole city blocks seems more than a bit callous. But you know what, at the end of the day I agree with Valentine's: I'm all about the urban renewal and increasing housing supply and stabilizing a neighborhood. Bring it on! I would *love* to see Valentines relocate downtown. There's plenty of space available - as well as bars and nightlife already comfortable there. It would add to atmosphere downtown - and it branding is well known. just more corporate greed stripping the personality out of a city to make it safe for bland, fleshy white people. unsurprising. money runs everything. hospitals and their parent corporations obviously should be in the residential development business. i'm so glad that's legal. "...but it looks like a diner and it feels like a diner." Well "La Di Dah" Mr. Fancy Pants. "Albany Med, like most hospitals, doesn't give a dam about history. Show me a hospital in a historic building and I'll show you a closed hospital." Really Eric Stott? Perhaps you haven't noticed, but Albany Medical Center, especially its Main building IS a historic building. Valentine's needs a new spot? No problem. There's plenty of places downtown. How about the old Sadie Klutz building if they want to stay in the same general area? As far as the diner goes -- that places has gone out of business twice in the last ten years. For all the people that like it, maybe they should have frequented it more often. The fact of the matter is this -- the neighborhood looked like crap. The residential area looks like crap. As a resident, I welcome the improvement. Thanks for the update Greg, that is definitely a much different (and better) tone than I originally understood it as! I appreciate the honest reporting and the great work that you guys do on this site. Keep it up! @Dave, I take some offense to your comments. As an immigrant from India, who works at AMC, I don't think this plan is a wholesale attach on folks of color. I've lived in Park South for 10 years and have slowly watch it go from bad to worse. I love my neighborhood, despite this, and love the fact that my community members stepped up, alongside the "institutional" players to develop a master plan for our neighborhood. No matter our skin tone (and Park South is a pretty diverse few blocks Albany, home to immigrants all around the world who primarily work at AMC, like myself, to white urbanist, to disenfranchise blacks, we all call this home) we all wanted to preserve the benefits of our current neighborhood (easy walk to work at the hospital or downtown for others; great park with wonderful opportunities all year round; awesome community to engage with whether for pleasure or to debate the City's issues, etc) and enhance it to meet our needs (more ties to transit, more retail and commercial venues, modern housing that isn't allowed to erode by predatory banks and slumlords). The plan that the community helped shape and approved is fairly supported by this development. And yes, this will impact some storied institutions, but we can't get 100% in life. I do hope that within the evolution of Park South, we can find a new home for Valentine's. Furthermore, our community hasn't been shy in the past and will continue to work with our partners and the Council to ensure that we can achieve as many of the objectives highlighted in the master plan are met (I'd like to see more rehab of current buildings, like have been done to the brownstones along Knox). This project impacts a quarter of Park South, there are plenty of opportunities to meet those few objectives that were missed on for this opportunity elsewhere in Park South. I have very fond memories of Quintessence, my mother worked there for years. The man I knew as 'Uncle Jimmy' and Henry and his wife were good people and the staff was always great to me. I wasn't very enthused with the re-opened diner. You can't bring back the past (but it was nice of them to try). It's tough to see the physical representation of memories gone, so I hope someone takes them up on the offer and hauls off the building. Valentines - meh. They could use a better space with some parking. I hope they find something decent. I can't agree with the whole "rawr corporate greed" attitude though. I hope people realize that Albany Med is a non-profit, charitable institution. It isn't greed, it's necessary expansion to accomodate the aging population. The hospital sees new patients every day. And it sees everyone from all walks, not just the 'fleshy white people'. I think moving that dump out of that dump, and into a spot where parking is not 1 - a big PITA, and 2 - synonymous to getting robbed (I've seen it happen in that area on more than one occassion) would be beneficial to the venue and to the music scene in Albany. Valentine's has long been a beacon for original music in the capital. I really hope to see Howard move forward and into a friendlier neighborhood and with the same philosophy on music. Change is inevitable. There are so many places Valentines can move to. Heck, there's even a space right on the corner of New Scotland and Madison (the lower level of a brownstone that's been vacant for as long as I can remember)? There's history that's worth preserving like the Cherry Hill in the South End and there's useless nostalgia. People on here are bemoaning empty and abandoned buildings? No wonder Albany looks the way it does. Absolutely, 100% agree with Paul Thomas and couldn't have said it better myself. Preserve or restore the history that's worthy and able. Protect it with proper maintenance and share it with the public so they can learn and marvel. Let go of the decrepit buildings that can barely stand and continue to rot. They're dangerous and an eyesore. Welcome and embrace the change. Be thankful that there are people investing money into this city at all... or we'll end up like Detroit. It would be more palatable if the proposed architecture wasn't so sterile and unresponsive. Why not incorporate Quintessence into the new hospital structure and turn into an additional hospital cafeteria, but with edible food? It will be sad to see Valentines go. Howard, Mike, and the venue as a whole, has been so cool to us for years. My cousin and I started playing open mics there ten years ago. Now we headline. Howard has been so supportive of art in the Albany area. We were extremely lucky to have a place like Valentines. So many good memories! The thing about Valentines is that it never got any walk-ins from foot traffic. Because of its location? If Valentines were to re-locate to a more friendly "night-life" area, it may increase business and exposure for artists who perform there. I will always miss the old Valentines. The smell especially. I mean that! I knew I was home when I walked in the door. There is nothing in the world like it. It runs through my blood and excites my mind. This could be a blessing in disguise. I'm excited about it! It could be good for Albany. But "the-old" Valentines will always be the number one music venue that has ever existed. I can't believe people are complaining that the toilet called Valentines will be gone. Boo Hoo. I'm sure the owner can open at a new, more desirable location, but if they don't book better bands more consistently no one will go after the initial buzz. I'm sure Walt Glassman is relieved to be rid of the place. Sorry that the "old" Valentine's days are numbered-Farmer Ted, with you on the smell, will miss it too. Place is full of memories for a lot of us. That said, the neighborhood has sorely needed this change for far too long. It's gone from a little sketchy, to kind of scary, to downright ugly and unsafe- time for a do-over. I think I like the proposed designs for the most part and disagree that they are unresponsive. They mesh well with the existing AMC structures, both old and new. It's about time Albany got at least a little current with its look, and got rid of those eyesore apartments. If AMC and the developers wouldn't invest and turn the area around- who would? Urban Renewal is NOT a good thing. This term is specifically for the 60s and 70s that saw the destruction of several neighborhoods within most of the country. This is not a good thing. Albany knows this very well with the Empire State Plaza. The large concentration at the Albany Medical Campus is straight up bad planning. It creates a dead zone similar to what you see in parts of Albany and in almost all suburbs in which everything is just one type of usage. Sure it brings in a lot of people who work there and are sick but it still creates this dead zone of nothingness. While I do admit some of the newer buildings around that area are very nicely done. Shops/offices on the first floor. As long as its just not a parking ramp only. Its better.